As we were sitting around Date Night headquarters discussing the location for tonight’s date, I happened to spy a $10 off coupon in the newspaper for Marlow’s Tavern. There is a Marlow’s about 2 miles from HQ, and we don’t usually need an excuse to pop into an East Cobb favorite. Tree huggers that we are, we decide to walk to dinner, and because it’s the hottest night of the year (90 degrees plus when we left), we are “glistening” by the time we reach our dinner destination. Marlow’s is always crowded at dinner, and at 6:45PM on a Friday night, we fear a long wait to use our coupon. We are told that the wait is 20 minutes, but fortunately, there are seats at the long community tables in the bar. Because we don’t want to wait, we take a couple of seats near the kitchen and settle in. 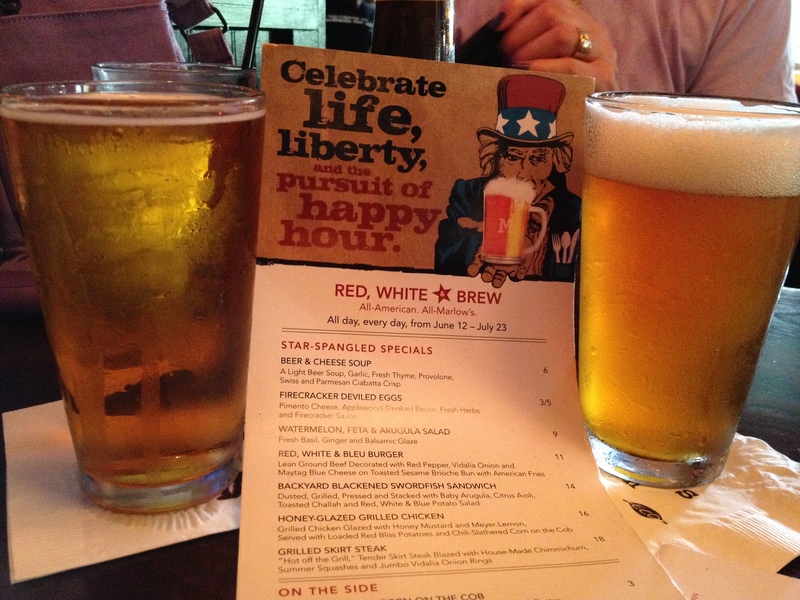 This is “Red, White and Brew” month and there is a special menu of food and a few extra beers added to the menu as well. It’s tough to pick a beer, but I choose the local Red Hare Saison Farmhouse Ale, which they just released. For you non-beer lovers, saison is a Belgian ale that is usually brewed in the summer and used to be brewed by farmers to drink after a long day in the fields. The Red Hare is amazing and they really have come up with a good recipe here. It’s not very dark, and was the perfect thirst quencher after that long, hot walk. It was so good, in fact, that I had a second one later! The Red Hare is on the left. Check out the head on the Ommengang! Staying with the Belgian theme, Eve picks the Ommengang Rare VOS, which is more amber in color and tastes a lot like my beer. More beer education: “Rare VOS” means “sly fox” in Flemish. Now you know. It has an amazing head and Eve thought she screwed up the pour, but after reading the bottle, we find that they want you to let the head foam up. Our server Kim is ready to take our order, and since we haven’t had crushed chick peas for a couple of weeks, we go for the hummus appetizer. There is hummus among us. 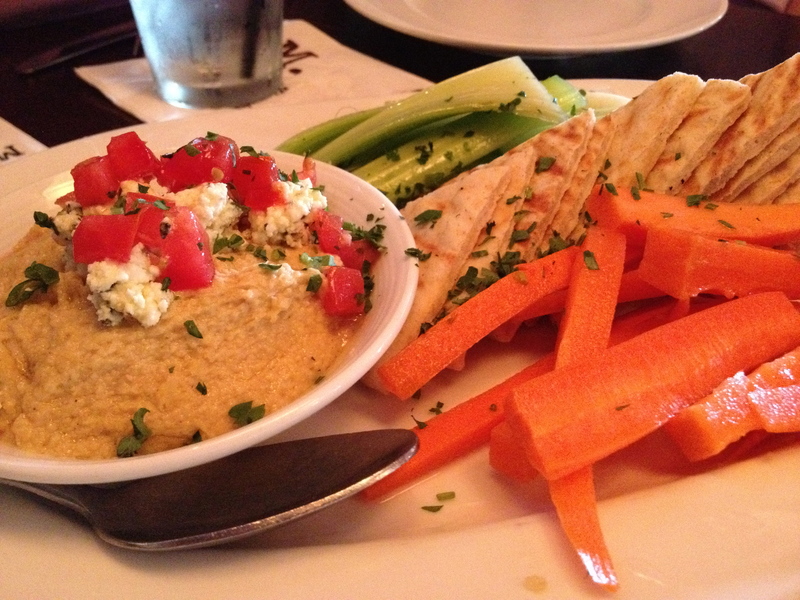 There is a lot of hummus on this plate, and the pita points are warm and soft. It’s important to eat your veggies, so we ate all of the carrot and celery sticks. I’m a celery guy, and Eve is a carrots girl, so there was plenty for both of us. 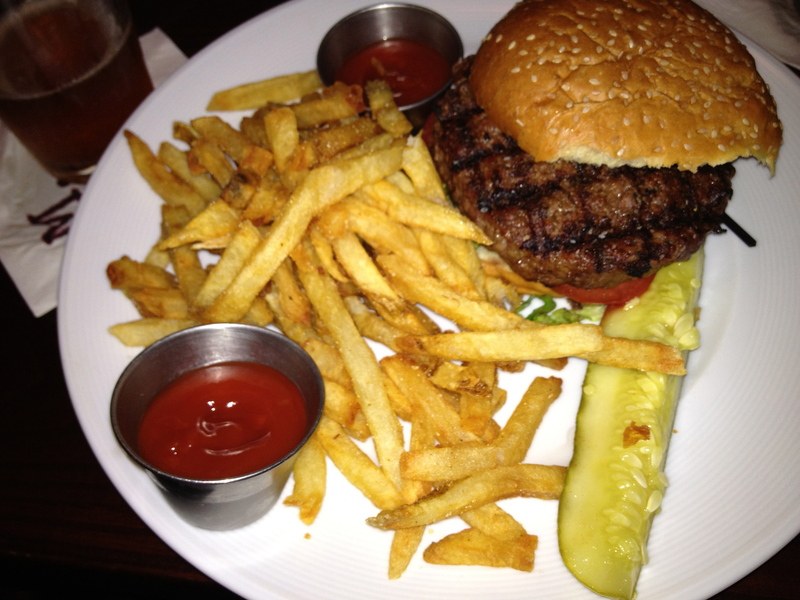 Marlow’s has really good burgers. The best in the city? Probably not, but we have never had a bad burger here. The big question at the table is to split one (lots of hummus in our tummies) or to each order our own. We both get our own. I order the cheeseburger with parmesan fries, which our server points out are $1.25. Yes, I am worth it. The cheeseburger with upgraded fries. Eve goes for the Tavern Burger, which is a burger with lettuce and tomato. Tavern Burger without the fries upgrade. She does not upgrade her fries. She likes the burger, but can’t finish it and takes half of it home for lunch on Saturday. Sometimes Date Night just keeps on giving. There are a lot of people at Marlow’s tonight and because we are sitting next to the kitchen, we get to watch the servers jostle in and out of the smallish space where the food comes up. It’s good entertainment and we are amazed at the choreography as each meal comes out. Plates are wiped down, food is arranged, the ice is delivered, more plates show up, and up comes a dessert ready to go. The place is bustling with activity. Since we are sitting at a community table, another couple joins us about halfway through the meal at ours. It turns out they know our next door neighbors. It’s a small world in East Cobb. 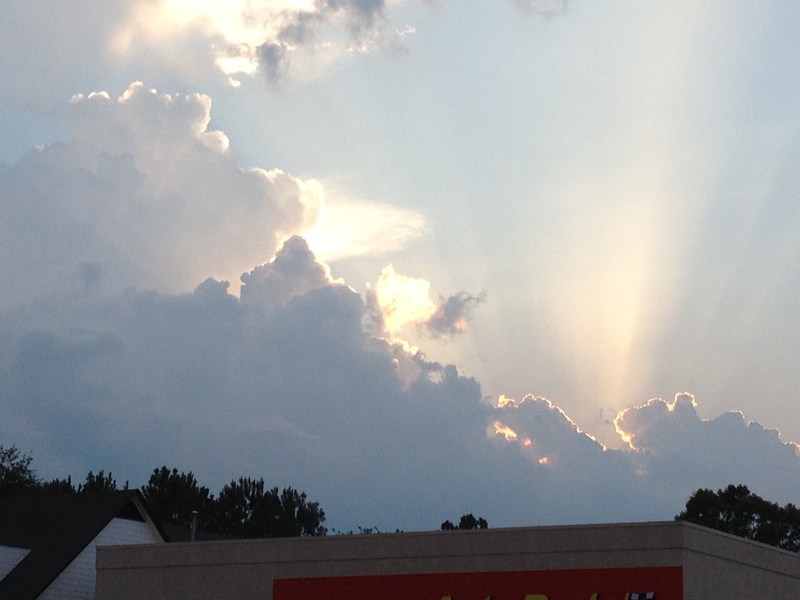 Cool sunset in East Cobb. As we leave at around 8PM, they are still waiting in line to eat. We are stuffed, but we still have to walk the 2+ miles home. There is thunder in the distance as we “waddle” home and we fear we are going to get wet, but the rain holds off. 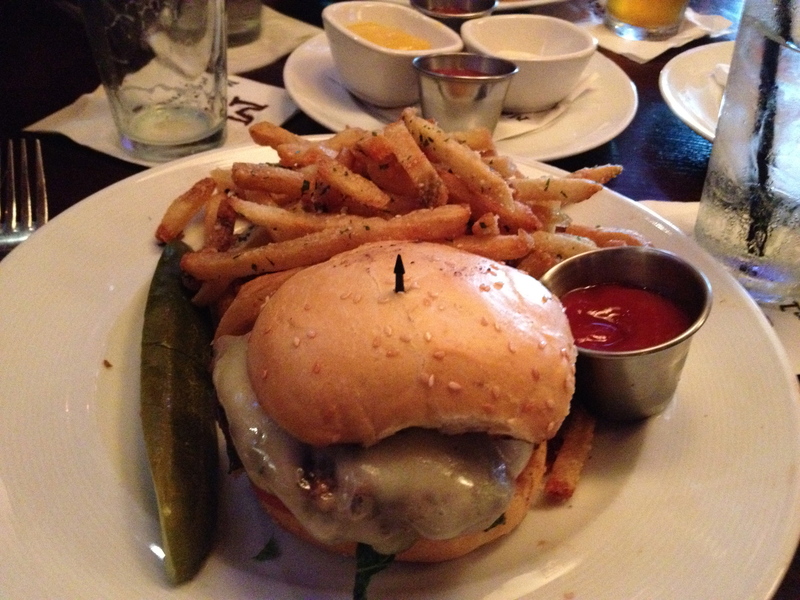 Marlow’s Tavern, Dunwoody GA – Marie, Let's Eat!